Samsung’s next flagship smartphone — likely called the Galaxy S10 — is almost here. 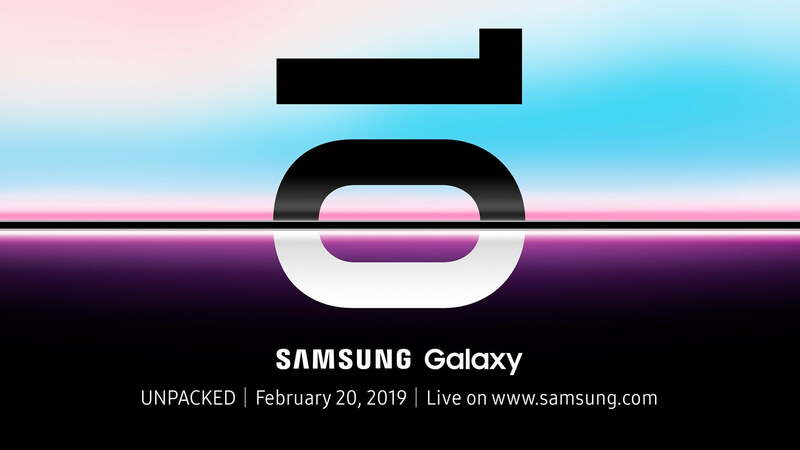 Rumors point to potentially three or four variants of the Galaxy S10 to debut at the Galaxy Unpacked event on Feb. 20, which takes place at the Bill Graham Civic Auditorium in San Francisco. The new and improved Samsung Galaxy S10 range is expected to be the superstar of the show, but it’s not all Samsung has been working on. We’re expecting to see a range of new technological goodies, from the long-awaited foldable Galaxy phone, to a new pair of wireless earbuds. Here’s what to expect. The Galaxy S10 has been all but officially confirmed. “As you may know, this year marks the 10-year anniversary of the Galaxy series,” the company noted in the invitations it sent out to media in January. Last year’s Samsung smartphone that debuted around the same time-frame was the Galaxy S9 — so it’s not a stretch to assume we’ll be seeing the launch of its successor, the Galaxy S10 — there’s even a giant “10” on the invite. But while “Samsung Galaxy S10” has been mentioned in most of the leaks so far, there’s a small chance Samsung could unveil a new naming structure for the celebratory phone, not unlike what Apple did with the commemorative iPhone X. What can we expect for the new phone? Well, it could actually be three handsets. The latest rumors reveal three names: The S10, S10 Plus, and S10 E. The leaks consistently signpost that all three of these devices will come with Samsung’s Infinity-O display — also known as a punch-hole display. If you’re not familiar with the design, the bezels surrounding the screen are nearly non-existent, and the selfie camera floats as a lone circle at the top of the screen — like a punched hole in a piece of paper. There’s a clue in the invitation image above — we can speculate the line running through the middle is representative of the bezel’s thinness around the phone. As ever with Samsung’s Galaxy S-range, we expect the S10 phones to sport top flagship specs for 2019. That means the Snapdragon 855, and rumors claim the S10 Plus will come with 6GB of RAM and 128GB of storage. The S10 E will reportedly come with two rear-mounted camera lenses, but the S10 and S10 Plus may distance themselves with a third camera on the back — a wide-angle lens — not unlike the Huawei Mate 20 Pro or the LG V40 ThinQ. Leaks suggest the S10 and S10 E will have a single front-facing camera lens, but the S10 Plus may come with a second selfie lens. It’s safe to say the S10 Plus will likely be the most expensive of the lot, and the phone you’ll want to buy if you want all the bells and whistles. It’s important to note these details are all based on leaks and rumors, most of which have been consistent, but you should still take everything with a grain of salt. It wouldn’t be a smartphone launch in 2019 without some mention of 5G sprinkled in. As it stands, it seems unlikely the mainstream S10 range will include 5G technology, but Samsung may release another version of the Galaxy S10 that supports the next generation networking technology. If leaks are correct, it’s due to be an absolute monster of a phone. The Snapdragon 855 is present again, but it’ll be joined by a whopping 10GB of RAM, up to 1TB of internal storage space, along with a massive 5,000mAh battery to boot. That battery capacity is likely to help deal with the battery drain potentially caused by 5G as it strains to search for cell service and reverts back to 4G LTE if none is available. As if that wasn’t enough, the phone is rumored to pack a quad-lens camera around the back as well as two around the front. Samsung already introduced a phone with four cameras on the back, so this wouldn’t be a stretch to imagine. It may also be the largest phone in the range too, thanks to a massive 6.7-inch Super AMOLED display. The name isn’t solidified in the same way as the other Galaxy S10 models, but leaks suggest the “X” seems to be in reference to the 10th anniversary of the Galaxy brand. It’s possible the phone’s name may be revealed as something else. When will it come out? Some sources claim the S10 X may arrive close to the rest of the S10 range, but it won’t come cheap. The expected starting price is $1,400. Smartphones with foldable displays are expected to be a big part of Mobile World Congress 2019, but Samsung may get the drop on its rivals by showing off the highly-anticipated foldable Samsung Galaxy phone at Samsung Unpacked. 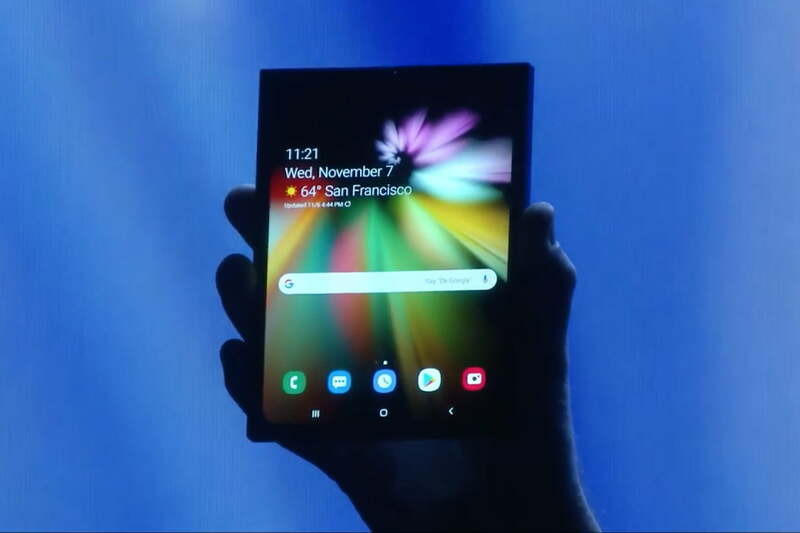 The company showed off its folding smartphone screen — the Infinity Flex — some time ago, but we’re still waiting to hear solid details on what exactly Samsung’s folding phone will look like, what the specifications will be, and how much you’ll be paying to get it in your pocket. We got a good look in a recently released YouTube video from Samsung. 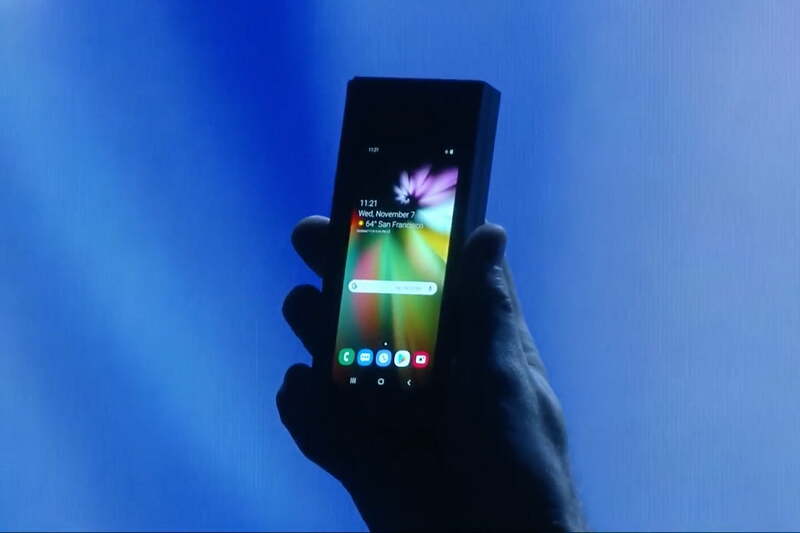 The video shows a smartphone being unfolded and viewed like a book, with the smaller viewing screen on the outside of the phone so you can see content without having to open it up. The back side may be similar to a usual phone, housing a rear-facing camera. It’s possible the phone will use the rear-facing camera as a selfie camera and the front-facing screen as a selfie viewfinder when unfolded — which would explain the lack of selfie cameras in renders. However, that’s all speculation on our part. This is how ZTE handled the single camera on the folding Axon M smartphone. With such a revolutionary design you can be forgiven for glossing over the specifications. 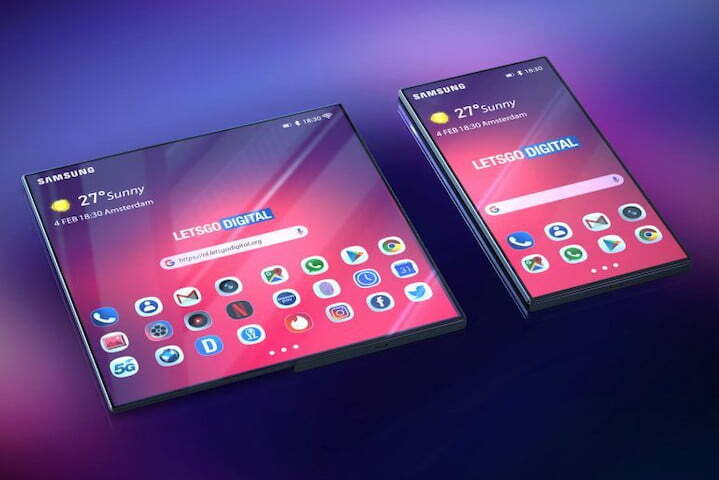 It’s expected Samsung’s foldable phone will utilize the Exynos 9820 processor in South Korea, and the Qualcomm Snapdragon 855 elsewhere, and may incorporate two batteries that add up to over 4,000mAh of power. But those high specs and world-breaking design won’t come cheap. Most sources place the phone’s release price being somewhere between $1,500 and $2,000 dollars. That’s a whole lot of green. With many manufacturers chasing the foldable smartphone dream, don’t be surprised to see Samsung make a big deal of its entry into this nascent smartphone design. 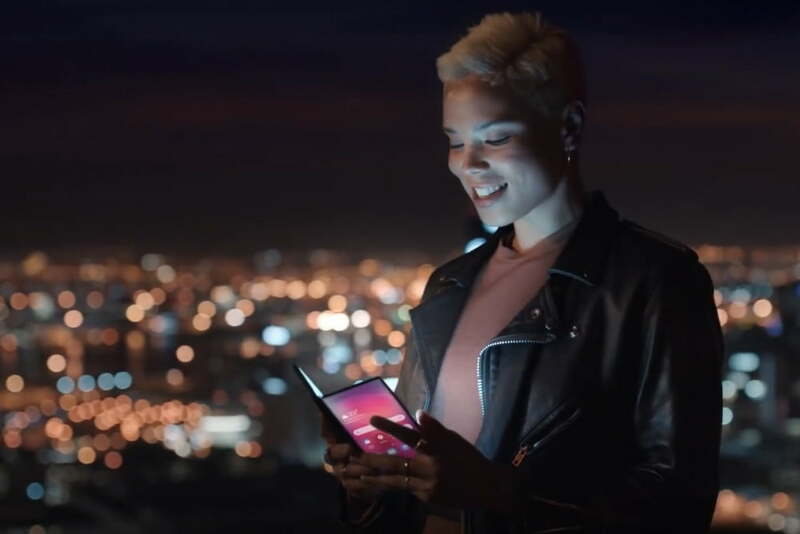 We already know for sure we will learn a little more about the foldable phone at Galaxy Unpacked that’s to this teaser video the company recently released. Whether it’s further teased or fully announced, there’s a good chance it won’t arrive a few months after the Galaxy S10 range. It’s not all about smartphones — we may see a number of new pieces of wearable tech from Samsung too. Top of the list of probabilities is the Galaxy Watch Active — the sportier version of last year’s Galaxy Watch. Samsung has dropped the “Gear” moniker on its wearables in favor of focusing on the Galaxy branding, but it’s assumed this will be a spiritual successor to the Galaxy Gear Sport. Weirdly, the only render we’ve seen shows a much sleeker design thank we’d expect for a sporty watch. It looks as though the Galaxy Watch’s celebrated rotating bezel is gone too, likely replaced with side buttons and a touchscreen. That’s sure to ruffle a few feathers. We’re not sure what Samsung’s planning to call this watch. While “Gear” is out for sure, we’ve seen a few names being punted about, including the “Galaxy Watch Active,” “Galaxy Watch Sport,” and even “Galaxy Pulse.” It’s likely to run Tizen OS instead of Google’s Wear OS, and we expect to see more integration with Samsung’s virtual assistant Bixby. The next version of the Gear IconX earphones might arrive at the Feb. 20 event as well, according to a leak from WinFuture. We don’t know much about the Galaxy Buds outside of the above image, but that’s all we needed to set our speculation-sabers a-rattling. The appearance of the earbuds suggests a “true wireless” design, with no wires between the two earphones. The box likely doubles as a charging case, with enough juice to charge both earbuds when out and about, but it’s the placement on top of what looks to be the Samsung Galaxy S10/S10 Plus that has us wondering. Could the S10 be able to wirelessly recharge the Galaxy Bud’s charging case? We’ve seen reverse wireless charging on Huawei’s Mate 20 Pro, and it wouldn’t be a stretch to see it between the Galaxy S10 and the Galaxy Buds. The Galaxy Buds have already gone through FCC certification, something which doesn’t usually happen until a product is close to launch. If the Galaxy Buds really do have reverse charging capabilities with the Galaxy S10 range, we fully expect to see it revealed alongside the new phones. Samsung unveiled its Galaxy Home smart speaker way back in August 2018, but it still hasn’t gotten around to actually releasing its pineapple-cauldron into the market. Interestingly, rumors suggest Samsung is already making a second Galaxy Home speaker. This would presumably be a smaller, lower-cost version on the same lines as the Amazon Echo Dot and the Google Home Mini. Unpacked could be the place we see both of these speakers. No matter what’s debuted on stage, Digital Trends will be on the ground in San Francisco covering Samsung’s Galaxy Unpacked on February 20, which starts at 11 a.m. PT or 2 p.m. ET. You can keep an eye on the latest news by following Mobile Editor Julian Chokkattu, or our Digital Trends Twitter account for blow-by-blow updates as they happen. We’ll add a livestream to the top of this page, so make sure to check back on the big day.